Keeneland was the obvious choice! What’s more Kentucky than horse racing? The couple desired for their menu to be inclusive to all tastes and worked alongside the Keeneland culinary team to put together a variety of options. From the delicate hors d’oeuvres to the hearty entrees, no detail went untouched. The cocktail hour featured lobster salad spoons, spring rolls, and beef carpaccio along with specialty bourbon cocktails. During the reception, guests were served a plated dinner consisting of a toasted walnut and bleu cheese spinach salad, whiskey brined pork loin, pan roasted breast of chicken, and meyer lemon risotto. How did you all meet? Tell us your love story. "We met at a summer research program for undergraduate students at Duke University in 2007. Nick was a student at Duke and Haylea was attending college in Lexington at Transylvania. While we weren’t working in the same lab, we spent basically all of our free time together and decided to continue dating long distance when the program ended. After college, Nick went on to work in Seattle at Microsoft and then on to Harvard Business School. He later started working in the technology industry in New York City. Haylea completed medical school at the University of Kentucky and then residency in OB/GYN at the University of Virginia. After 10 long years we are so happy to be married and finally in the same place!" "Nick proposed during a visit in NYC in May 2016. He popped the question in the street while walking to dinner. Haylea was expecting to be proposed to at the restaurant, and so he managed to pull off a surprise!" What feeling or style were you trying to channel with your décor and color palate? "We wanted a design scheme that would complement the beautiful green surroundings at Keeneland. 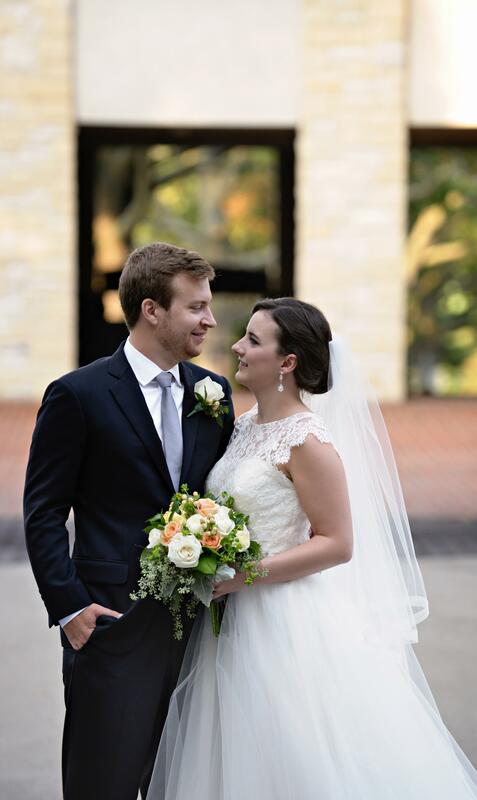 Our wonderful planner (and Haylea’s uncle) Buddy Hoskinson guided the selection of navy and gray for the bridal party and soft fall colors with gold accents for the flowers and décor." "There are so many details that made our day special. We loved kicking off the start of our ceremony with Steve Buttleman, Keeneland’s Bugler, playing, and we walked out to My Old Kentucky Home."